John Pollock is joined by Phil Chertok & Ziggy Cao for a big review of Saturday’s UFC 227 card from the Staples Center in Los Angeles. 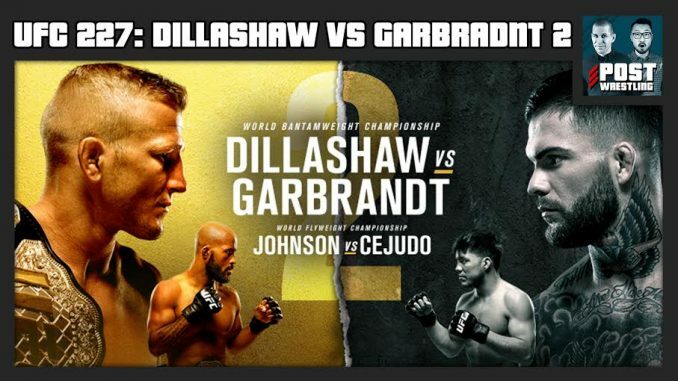 The three chat about the successful title defense by T.J. Dillashaw, earning his second victory over Cody Garbrandt and doing so even quicker than their first fight last November at UFC 217. What is next for Dillashaw at the bantamweight division and is a fight with the new flyweight champion of interest? The 2,142-day title reign of Demetrious Johnson is over as Olympic gold medalist Henry Cejudo took a razor-close split decision and became the first fighter to ever beat Johnson at flyweight and become the second UFC flyweight champion in history. Plus, a review of the entire UFC 227 card, a discussion on the announcement that Khabib Nurmagomedov will fight Conor McGregor in October and next month’s UFC 228 card from Dallas featuring two title fights.